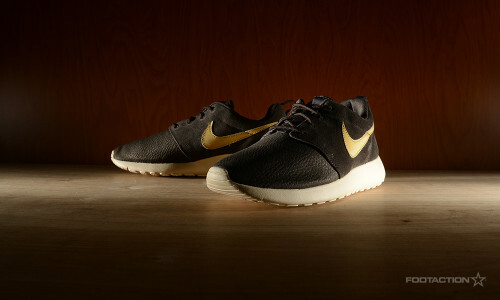 The Nike Roshe Run series throws a curveball by releasing a Suede version rather than the usual mesh construction of the shoe. Dressed in a combination of Velvet Brown, Sand Dune, Volt and Metallic Gold, the technical design aspects of the sneaker remain the same. The upper of the shoe has a fancy touch of gold on the Swoosh and a cream colored/off white sole. Built with a cushy midsole and premium upper that can be worn with or without socks, dressed up or down, or just for walking and taking it easy. Print article This entry was posted by hhcblog on November 5, 2014 at 4:48 am, and is filed under Footwear. Follow any responses to this post through RSS 2.0. You can leave a response or trackback from your own site.